Comments on: "A. P. J. Abdul Kalam Quotes: Man needs his difficulties because they are necessary to enjoy success." Dream is not that which you see while sleeping it is something that does not let you sleep. You cannot change your future, but you can change your habits, And surely your habits… Will change your future. Avul Pakir Jainulabdeen "A. P. J." 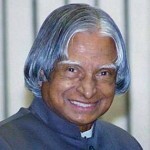 Abdul Kalam was the 11th President of India from 2002 to 2007. A career scientist turned reluctant politician, Kalam was born and raised in Rameswaram, Tamil Nadu, and studied physics and aerospace engineering. He spent the next four decades as a scientist and science administrator, mainly at the Defence Research and Development Organisation and Indian Space Research Organisation and was intimately involved in India's civilian space program and military missile development efforts. He thus came to be known as the Missile Man of India for his work on the development of ballistic missile and launch vehicle technology. He also played a pivotal organizational, technical, and political role in India's Pokhran-II nuclear tests in 1998, the first since the original nuclear test by India in 1974. Kalam has received honorary doctorates from 40 universities. The Government of India has honoured him with the Padma Bhushan in 1981 and the Padma Vibhushan in 1990 for his work with ISRO and DRDO and his role as a scientific advisor to the Government. In 1997, Kalam received India's highest civilian honour, the Bharat Ratna, for his contribution to the scientific research and modernisation of defence technology in India. In his book India 2020, Kalam strongly advocated an action plan to develop India into a "knowledge superpower" and a developed nation by the year 2020. He regarded his work on India's nuclear weapons programme as a way to assert India's place as a future superpower.